Done correctly, traffic light trails can produce striking almost abstract images. However, getting the perfect shot isn’t quite as easy as it sounds. So, what’s the technique behind it? Well, the good news is to capture light trails all you need is a camera that will allow you to control the exposure time and a tripod, no expensive filters required, no fancy lens’s although a very wide lens will give a more dramatic result, as we’ll see further down the page. 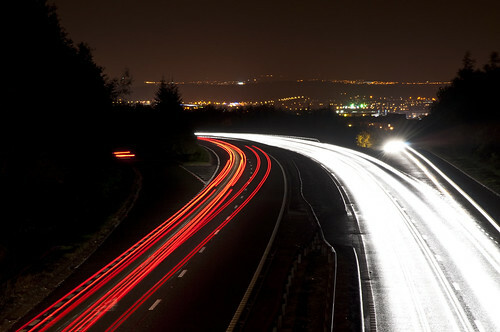 Obviously, you won’t be capturing light trails in daylight, no lights on the traffic equals no light trails, no matter how much you filter out the light so we’ll be working at dusk, dawn or for best results at night. Also, think carefully about your location. An obvious place to start is a motorway footbridge. The advantages here are, dark road, lots of traffic and on a bridge you can get central to it safely. The actual technique is the same in all the shots below. Set your camera to Aperture Priority mode and try to get your shutter speed into the 20s sort of bracket, any more and you risk flooding the scene with too much light, 20s on fast moving traffic will be more than enough. Be careful to not to over or underexpose the surrounding area. Under exposed and you’ll get a dark image with the light trails, over exposed and it’ll likely take on a brownish hue and look false. 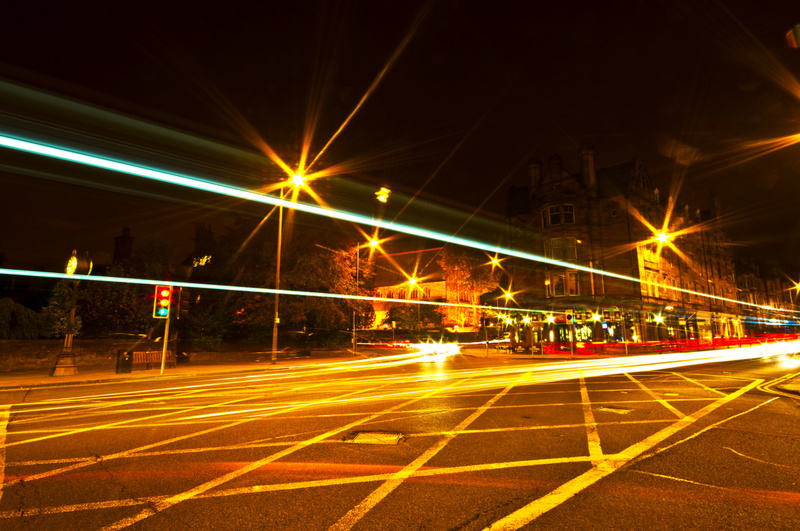 Get the scene correct and let the light trails take care of themselves! This shot was taken on a bridge on top of a 2 lane dual carriageway, the trick here is to time the shot when the most traffic is in the scene, try to make sure there are cars on both side of the road to get a balanced shot. Another option is to get right down to the roadside and take the shot from the pavement. Don’t be tempted to do this with a motorway for obvious reasons. A squashed photographer doesn’t take many good shots! This is best attempted in an urban area where there is something of significant background interest. 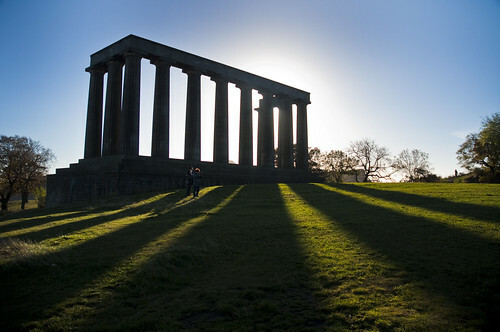 This shot was taken at the top of the Mound in Edinburgh, the technique is mainly the same as above. Expose the scene correctly and then wait for the traffic before you open the shutter. Don’t just give it one go, once your setup, take loads, you’ll get all different results. Emergency vehicles with flashing lights give unusual results too. Once you’re in an urban setting buses are your friend. As the bus is lit inside as well as having headlights you get a stronger trail from a bus. Double deckers are even better as it gives you some nice high trails in the shot. 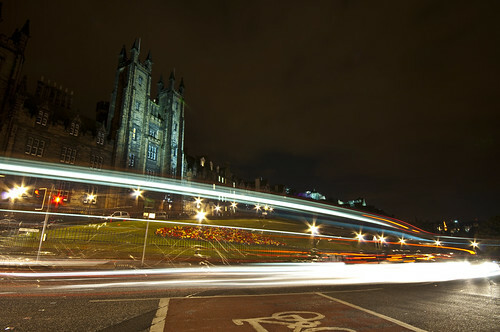 Be careful though, this is a failed attempt at side of road light trails, the reason it failed? Too much ambient street lighting. The junction was simply too well lit and the trails just don’t stand out enough. This is an example of putting the roadside and central technique together. 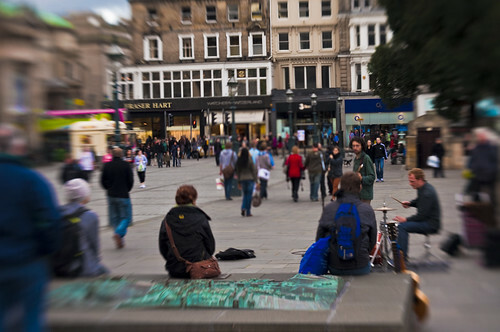 Here I’ve placed the tripod directly in the centre of Edinburgh’s famous Princes Street. Luckily, this location has a small thin traffic island running the length of the road providing a safe area to take the shot. This example was taken with a very wide lens at 10mm. There’s a lot of ambient light here but it’s out to the sides of the shot and doesn’t affect the trails. As there’s a LOT of bus traffic it’s a near perfect location. This is a 20s exposure at f22. The scene is correctly exposed, there’s sufficient background interest and because the traffic goes along in a straight line we get very definite straight light trails. By far the best method but choose your location carefully and above all, be safe. You can also just about do this sort of shot at dusk or dawn. 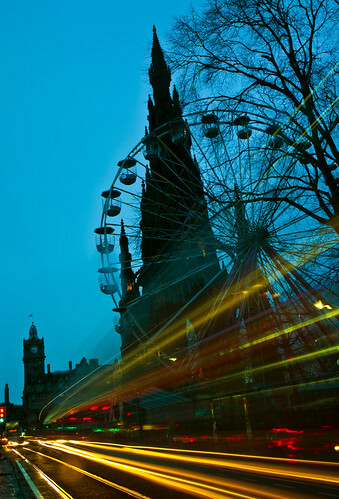 This was meant to be a sunrise shot with the big wheel and Scott Monument, in the event it was dull and overcast. There was too much light to get a 20s exposure but even the shorter exposure has added to a not very dramatic scene adding a much needed burst of colour. So there you have it. It’s not that hard and it’s 90% about choosing your location wisely. Do experiment when you find a good location, different densities of traffic provide very different shots. Don’t be afraid to rattle off hundreds of shots if need be. Every one will be different and you never know what might be the best when you download the results. 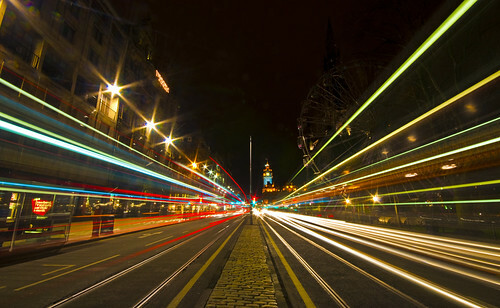 Feel free to leave a comment below or show us your best light trail examples! Railings? Railings, I hear you cry? 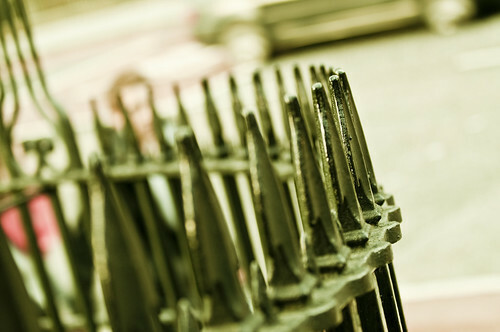 Why on earth would you want to take pictures of railings? Well, put quite simply, done correctly with a shallow depth of field, you can get some amazing abstract images and it’s really not that hard to do. I’ve also found it a great way to save a photo outing when the light is terrible for “normal” shots. Regardless of the light you’ll be able to do something with a humble railing. So, what do you need? Well, a DSLR helps, obviously, or a compact that will allow you to control the aperture. All the shots that follow were taken with either a Nikon 50mm f1.8 or Sigma 70-200mm f2.8 EX HSM lens. Both end of the spectrum here, the 50mm is ultra cheap, around £110, the Sigma nearer £700 but both will let you do great railings. In fact, even a kit lens at its widest setting, usually about f3.5 will allow you to get some kind of decent bokeh effect. 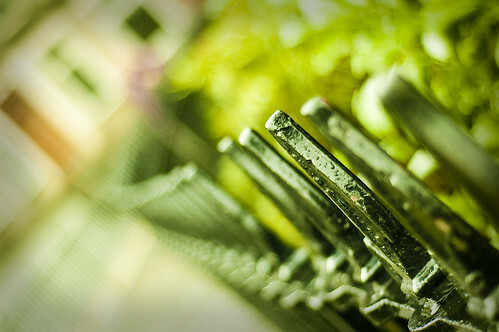 It might seem obvious but metal railings are what we’re looking for, not wooden fences, mainly as the light will “glint” on metal railings allowing us to get that bokeh effect we’re looking for. What’s bokeh? See those little fuzzy circles of light, that’s bokeh and using it correctly can produce some very striking results. The main technique involves setting the lens to its widest setting, in the 50mm case, f1.8, in the 70-200mm, f2.8. Now, pick your railing and pick a spike to focus on, you want to be as near as possible to the minimum focal distance from it you can. In the case of the 50mm its about 45cm. 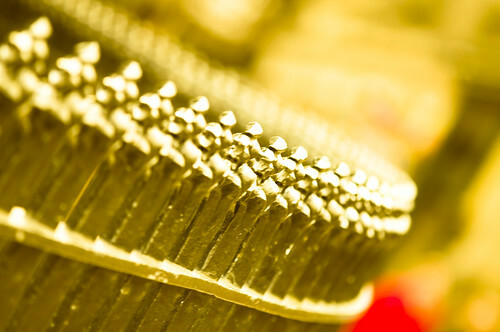 Focusing on a spike at 45cm distance at f1.8 will produce an extreme bokeh effect, moving a few feet away and focusing on the same spike will lessen the effect, play about and see what works. Walking towards the Playfair Steps there’s a set of railings here with fairly sharp spikes. This shot was taken on a fairly sunny day at a big zoom at f2.8 with the Sigma giving a WILD bokeh effect. Running right around the National Gallery are another pointy set of railings, immediately across from the first shot, again, an extreme bokeh effect with a little sunlight hitting the tops of the peaks. These railings are found on the driveway up to Calton Hill; they are right at the entrance gates and sweep round into Regents Road. At the right angle with a little sunlight, this is roughly what you’ll get! Found at the top of the Mound leading down to the National Gallery of Scotland is the Playfair Steps, looking down these gives a nice effect, even better if there’s a few pedestrians about waiting to be turned into lovely bokeh! The Mound is a great area to play around with these shots, there’s so many railings! This is on the corner of Mound Place and The Mound, a nice sweepings set round the corner. Focus on the apex of the curve, job done. The Hub’s not hard to find. It’s that huge spire just next to Edinburgh Castle. At its entrance is a nice set of sweeping railings. 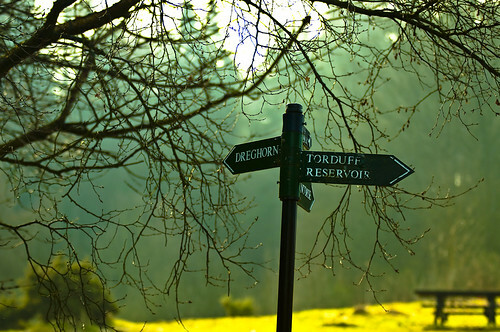 This is the one to the right, heading up towards the Castle. A bit out the City Centre but the Botanics is a photographers dream at the best of times. If you get fed up with the flowers, try the railings! This set is just to the left of the North Gate. These attractive green railings are at the bottom of Waverly Bridge, just at the bottom entrance to East Princes Street Gardens. This was a shot with the 50mm lens after an outing to take shots of the Xmas big wheel during the day, in the end I preferred this to any of the wheel shots. 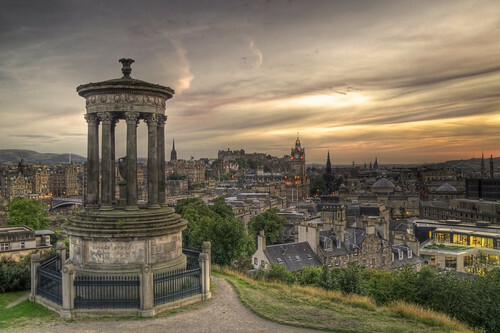 The Dugald Stewart Monument is usually the subject of many of Edinburgh’s classic views from Calton Hill but take a closer look at the structure and you’ll see these great ornate railings around the base. Shot with the 50mm lens. Just below Calton Hill is Regents Road, there’s a huge set of railings down one side of the road here, get in the right position and you can get Arthur’s Seat as a backdrop! Shot with a Nikon 18-70mm DX at f3.5. So that’s my top 10, I’d love to hear any other suggestions. 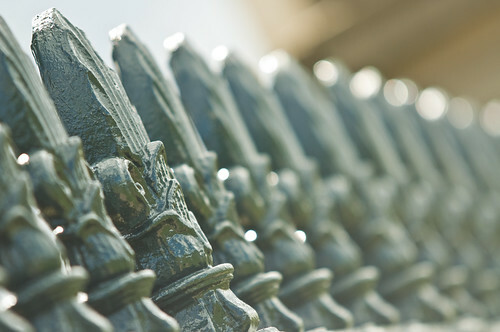 Feel free to post them or your own shots of Edinburgh railings in the comments below. 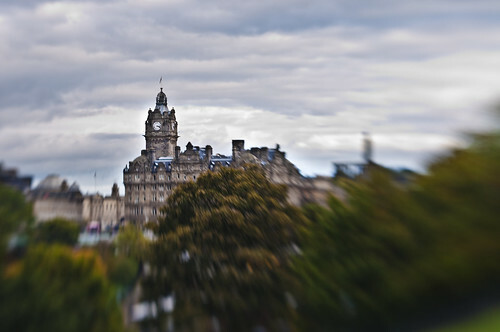 Yet another 11 must do Edinburgh photographs! 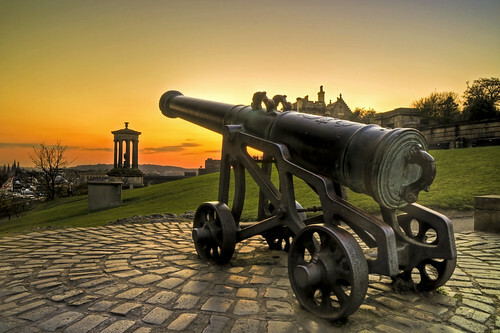 We’ve already featured Blackford Hill as the perfect vantage point to photograph Arthur’s Seat but while you’re up there you’ll want to turn your attention to Edinburgh Castle. You’re about 1 mile from the Castle here so you’ll need at least a 200mm lens to have any chance of a close-up. The most likely approach to the hill is parking in the car park at the back of the Observatory. If you feel fit, head up the hill towards the telephone mast and turn right as soon as you can. 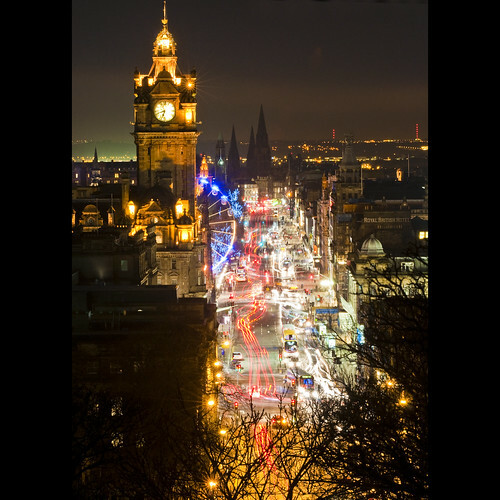 This will bring you out on the lower slopes and you’ll get your fist view of Edinburgh. It’s steep to the top from here but if you keep on the path up to the mast then turn right up the steep bit of hill it’s much easier as it’s a steeper but much shorter climb to the trig point. Once you there, pick your spot, you can’t go wrong! If you’re down Holyrood way you can’t have missed the Scottish Parliament building. An odder looking structure you’ll be hard pushed to find and from ground level at least, it’s one ugly building as well. The best way to view this is from above. 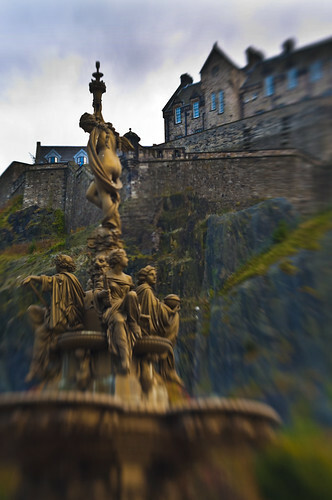 It changes the whole view somehow and you’ll get the bonus of Dynamic Earth next to it as well. 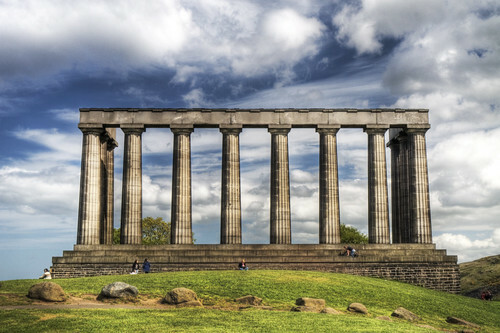 From outside the Parliament building, shield your eyes from the ugliness and walk over the road towards Salisbury Crags. Turn left and look for the small red cinder path leading up the face of the crags. It’s a seriously steep climb here; thankfully you won’t need to go all the way round, just high enough to get a decent elevation on the buildings. This one is a personal favourite of mine. 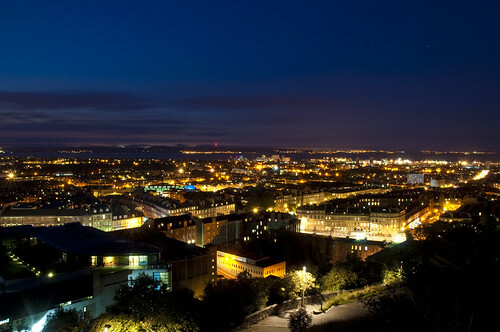 I stumbled across this shot by accident one night while up on Calton Hill taking some more classic shots of the city at night. 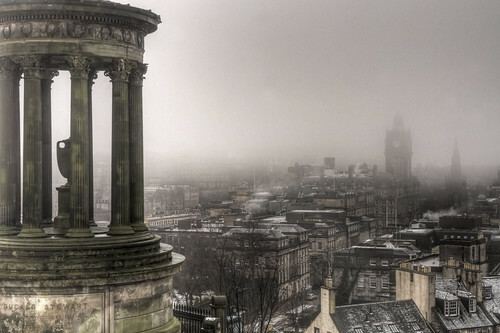 Up at the side of the Observatory dome is the best place to be, walking round and there is a small railing that leads around to the Dugald Stewart Monument, the start of this railing is the spot. Look for the brightest spot along the shoreline, this will be Leith Docks and this is roughly where you’ll aim, a wide lens is a must here. In the proper dark, you’ll be looking at around a 2 minute exposure at f16 here but its well worth the effort. Also a nice shot to try at dusk as the lights start to come on. 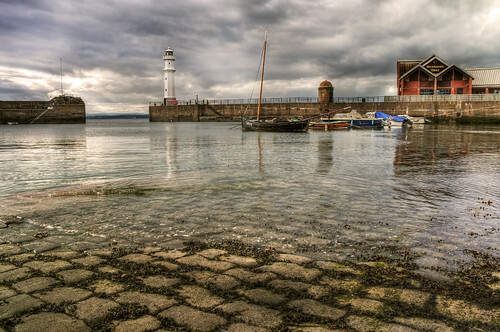 Down on the coastline just 5 minutes from Ocean Terminal is the small historic harbour at Newhaven. As you get here, the first thing you’ll see is the large while lighthouse out on the edge of the harbour wall. In itself, it’s an interesting shot to take but for the best of Newhaven, use it as a backdrop instead. From the side nearest the road, take you pick of the boats and off you go. There’s also a nice shot to be had on the walk out to the lighthouse between the railings. A great spot for sunsets all year too. No visit to Edinburgh would be complete without a visit to Greyfriars Bobby. 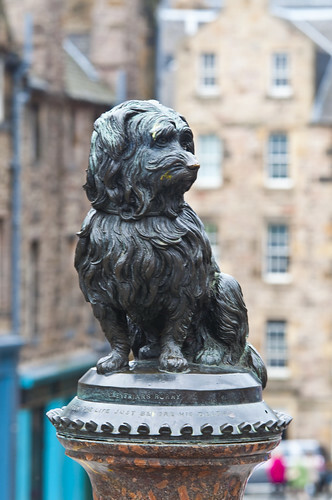 The statue of Edinburgh’s most famous dog sits on the corner of Candlemaker Row and George IV Bridge just across from the junction at Chambers Street. During the festival you’ll almost need to queue up to take the shot. Little tip here, don’t be tempted by the pub of the same name right opposite the statue, worst beer in Edinburgh, you have been warned! 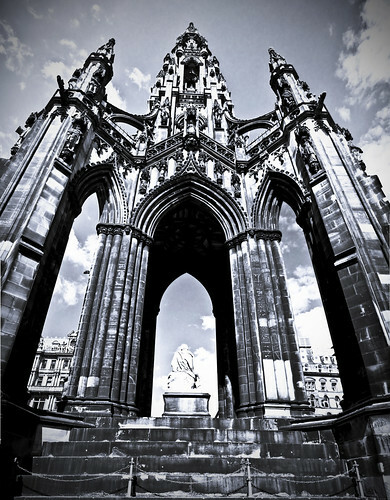 Built as a tribute to Sir Walter Scott the large black imposing structure of the Scott Monument dominates east Princes Street Gardens. 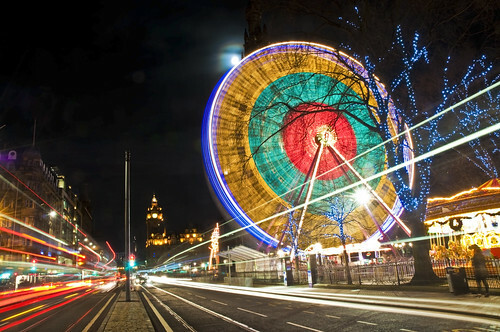 This is the location of the Christmas big wheel in Edinburgh too. You could photograph this from anywhere in the gardens but with a serious wide angle lens, try it from immediately below, or even as a ventorama for something just a little different. Try going up it too, amazing views from the top. Probably only worth attempting if you have a car at your disposal and it’s a bit of a walk if you don’t. At the edge of St Margaret’s Loch in Holyrood Park is a little one way road that leads around Arthur’s Seat. Note that the road is not always open so you might be disappointed, especially at night or on a Sunday afternoon. If it’s open, drive up till you pass Dunsapie Loch on your left hand side. Just past Dunsapie park up at the edge of the road. 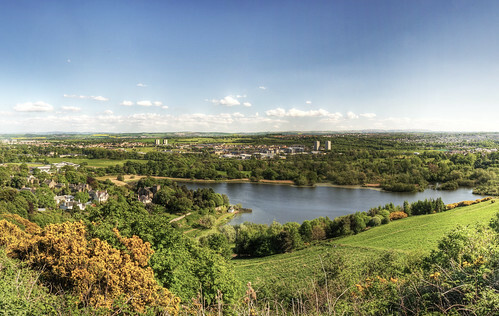 Looking down, you’ll see the large Duddingston Loch and the church beside, this is your shot right here! Another little tip here, don’t try this one at night, shall we say this is a popular area for “dirtier” activities in cars at night! A really easy one here. 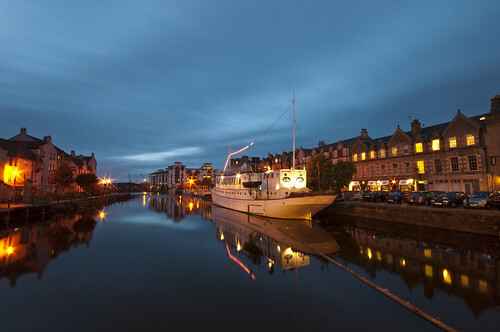 From Commercial Street in now fashionable Leith on the shore there’s a road bridge over the Water of Leith. This is your spot, especially good on a nice calm night. 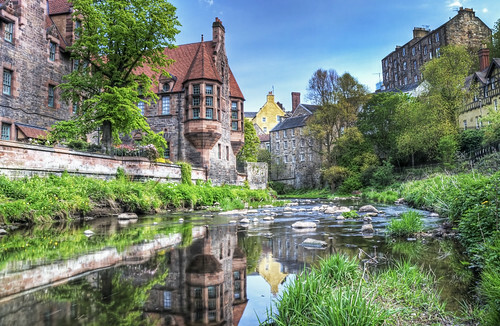 Visiting Edinburgh, you must visit the Dean Village. It’s hard to believe this oasis of quiet is just minutes from the centre of Edinburgh. 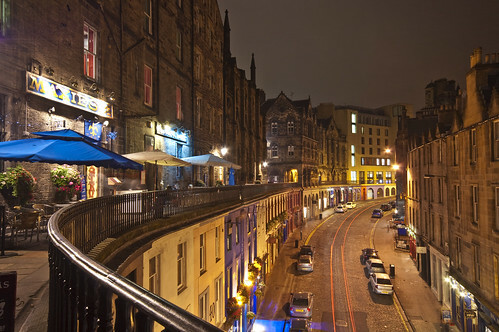 At the west end of Edinburgh head out towards Queensferry Road, before you cross the Dean Bridge there’s a steep downhill cobbled street. Follow this down into the Dean Village and you end up at a small bridge. Don’t cross the Bridge but follow the street further down keeping the river on your right, now you’ll be at a small footbridge. Just below this footbridge is your spot. Easy to get down to if the water is low. Look upstream and there’s your shot right there! Obviously this isn’t an all the time shot but it does happen with some regularity. The best of the lot is the Bank of Scotland Fireworks to mark the end of the Festival but there’s also a 10 minute display on every Saturday night after the Tattoo during the Festival around midnight, more at midnight on Hogmanay (December 31st) and sometimes on November 30th (St Andrews Day). 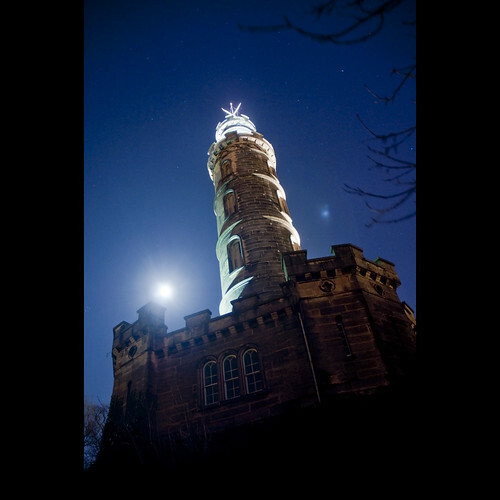 With stacks of vantage points around the city Blackford Hill is again one of the best. 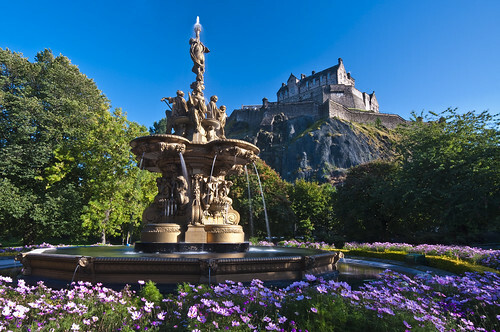 However, Inverleith Park, Arthur’s Seat, Calton Hill and numerous city centre spots will also give you pics to be proud of. 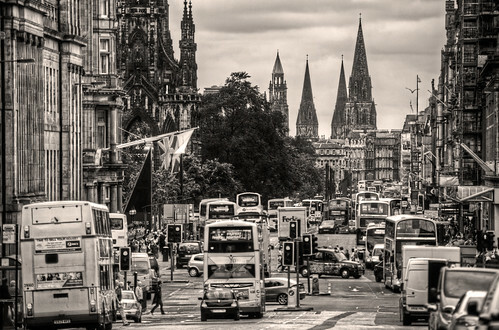 Take the A71 out of Edinburgh on the West side of the city. After a few miles you’ll see a turn off for Ratho on the right. 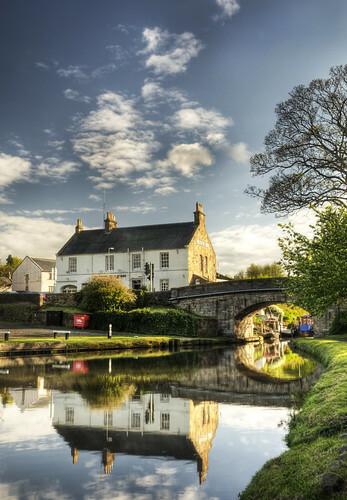 Take this past the Ratho Park pub and keep going for about 1 mile into the village of Ratho, turn right at the junction and follow the road around till you see the Bridge Inn pub. Park up here and cross the humpback bridge and head down onto the canal towpath on the right. Just up here is your spot, even better on a calm day. So there we go, another 11 to keep you busy. Feel free to leave your comments below. So, first things first. 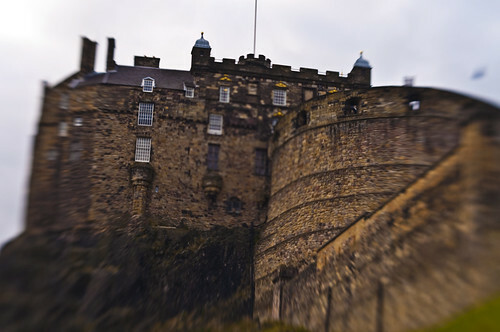 What exactly is a Lensbaby? In simple terms, it’s approximately a 55m lens on a bendy bellows what allows selective focus. It comes in 3 flavours, the basic Muse, which is, to be honest, not the easiest things to use. The more advanced Composer which allows you to lock focus which means you can use it on a tripod and spend time to get your focus bang on. Finally there is the Control Freak, or 3G as it used to be called. A strange looking lens that allows you to lock the focus, fine-tune it and then fine-tune your blur with the 3 adjustable screws around the lens. Owning both a Muse and 3G I can say without doubt, if you buy one, get the Composer or 3G, so much easier to use. Also, go for the glass optics, the plastic optic versions are cheaper but give a much less sharp image. Prices range from around £89.99 for the plastic optic Muse up to £229 for the Control Freak. With the Lensbaby lesson out the way we can get onto the photo walk route. When I set out today I had no intention of this turning into a Lensbaby day, the Nikon D90 had the Sigma 10-20mm lens on to start with but when I finally used the 3G Lensbaby the idea for this blog post hatched. With that in mind, lets do a quick overview of the route, and you can always refer to the map at the bottom of this post which shows the position I took each of the following 10 shots from. I focused mainly on landmarks and steered away from arty farty type low DoF shots for this and the main focus of today was to capture the familiar in an unfamiliar way. Parking at Kings Stable Road, which is always easy to get parked at, I went into West Princes Street Gardens, passed through to East Princes Street Gardens, back out at the same side I went in at the National Gallery, up The Mound, Mound Place, Ramsay Lane to Edinburgh Castle Esplanade. From here, out to Johnston Terrace, Castle Terrace and down the steps back to Kings Stable road. Not that hard going and took about an hour and a bit to complete. Easy enough for most people. Equipment used was a Nikon D90, Lensbaby 3G with the f4 aperture ring fitted, Giottos Tripod and remote switch. All shots were in manual mode, as the Lensbaby will not work in any other mode setting on the D90. 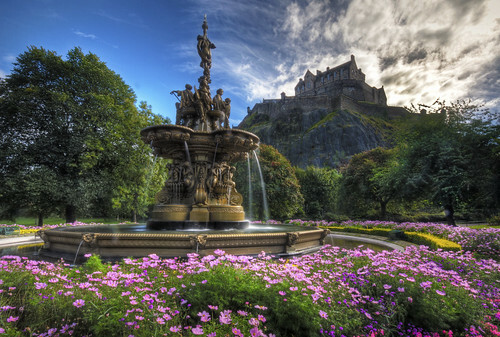 First off, the classic shot from West Princes Street Gardens. Sadly, at this time of year the flowers are dug up and the water tuned off not that it really affected this shot though. Focus was on the top of the fountain. 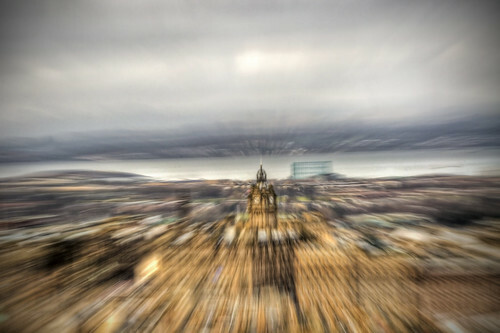 Focal point here is on the clock with the blur bleeding in from the left hand edge over the Scott Monument. Taken from the side of the National Gallery looking east. From the National Gallery we head up the Mound, from the first corner here you get a great view of Ramsay Gardens, the most exclusive address in Edinburgh. You’ll see why when you pass though here on the way to the Castle. First of 3 from the high vantage point of Mound Place. Here, the focus point is the Balmoral Hotel clock face. 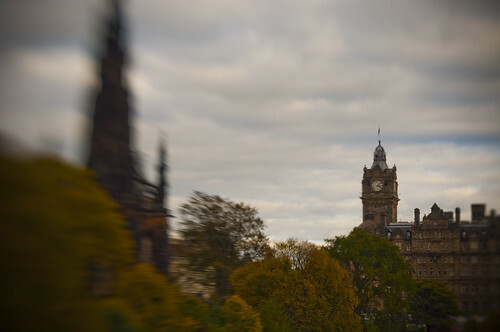 I find if there’s anything that is expected to be sharp, writing, clock face etc, it makes an excellent focal point to Lensbaby shots. 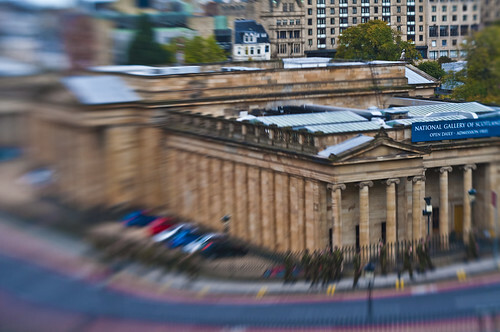 Looking down a bit more is an ariel view of the National Gallery of Scotland. Focal point here is on the pillars on the right. From this elevation it’s almost a tilt-shift shot with the Lensbaby. 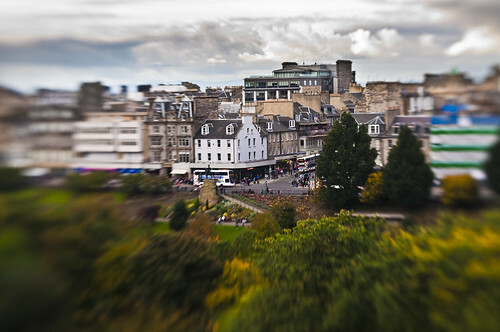 Focal point here is on the junction in Princes Street itself letting the blur come in from both edges and up from Princes Street Gardens. When the Tattoo grandstands finally get dismantled there’s a great view towards the south of Edinburgh from here. Only part of the wall was accessible today so this is the best view I could get. 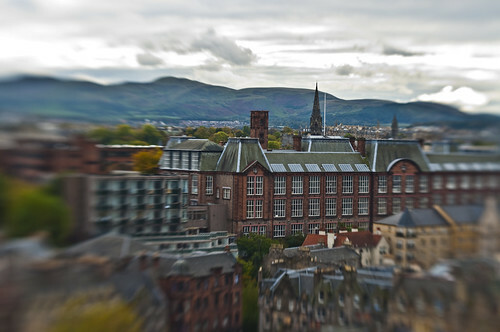 Focal point here is the back of the old building of the Edinburgh College of Art with the Pentland Hills as a dramatic backdrop. 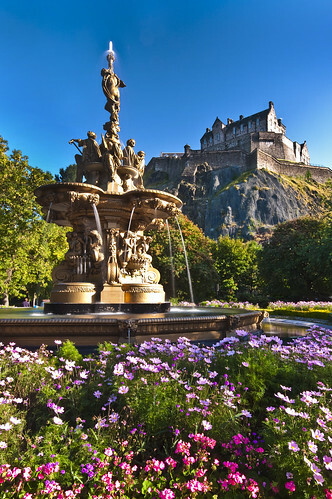 Tuning right down the steps as you leave the Esplanade takes you down into Johnston Terrace where you can get this fairly classic view of Edinburgh Castle. For our final shot we walk down Johnston Terrace to the top of the amusingly named Granny Green Steps. 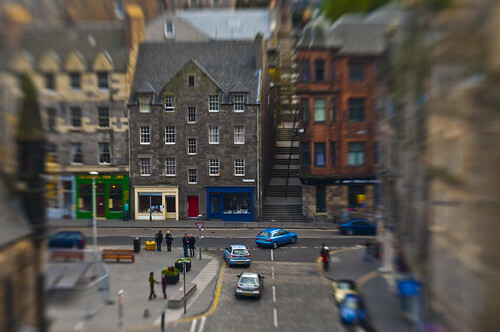 From this point you can get a view of where Kings Stable Road joins the Grassmarket, again from this elevation it looks almost like a tiltshift. 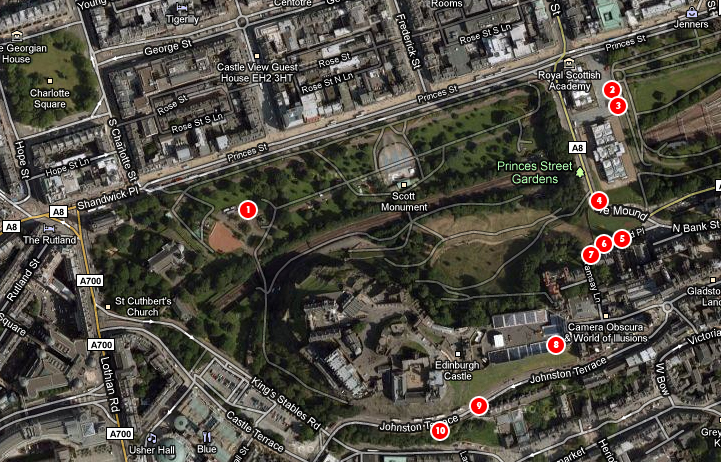 Below is a map showing the location I took each shot from, thanks to Google Maps for the map. Feel free to leave your comments below, if this post goes down well I’ll try and suggest some more photo walks around the city in future. Best done at night this one I think. And for that reason, best not done on a Friday/Saturday night as your right in the middle of the student drinking area here! Right at the bottom of Candlemaker Row, is a traffic island. Standing on that island you get the best view of this shot. 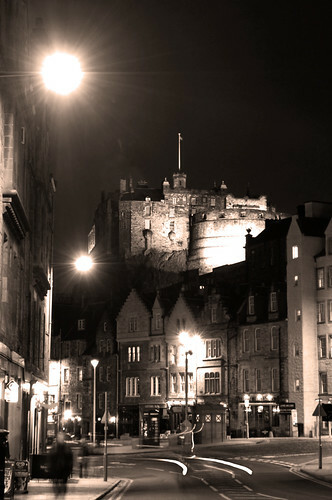 Looking over the old building of the Grassmarket is the Castle, looking pretty imposing from this viewpoint. 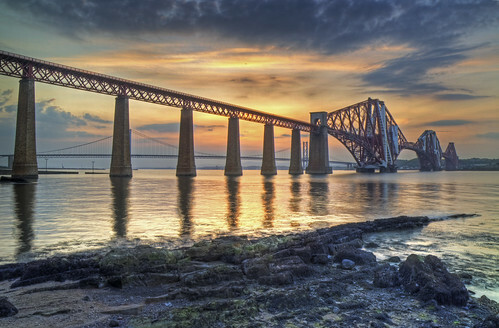 You couldn’t make the trip out to photograph the Forth Bridge without turning the camera onto the Forth Road Bridge. 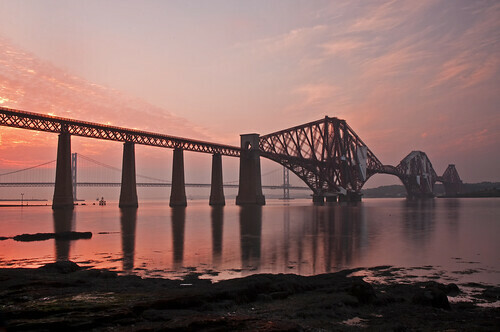 Often seen as an ugly sister to the striking Rail Bridge the Road Bridge is still a striking subject. There are 2 choices I’d recommend here. In South Queensferry itself is a small Harbour near the Orroco Pier pub. Head down there and to the left there’s a little bit of beach, You can get a nice low down shot from here taking in the rocks on the left. If that’s not your thing, head over the bridge to the North side. 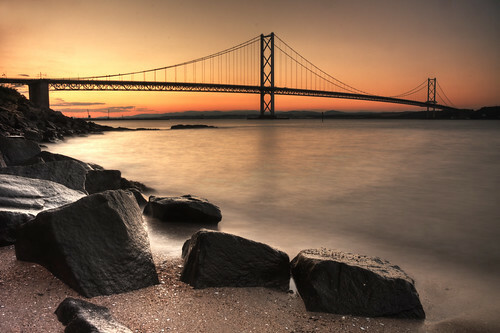 Take the first exit once you’re over the bridge and head towards North Queensferry. As you come down the twisty road there’s a road off to the left. This takes you to a hotel car park. Next to the front of the hotel is a little path off up to the right, follow this up and you get to a viewpoint for the bridge. Great for long exposure night trail shots. You can also get out on to the bridge walkway from here. This one will take a bit of walking to find by well worth the hike over the hill. At the top of Cairnmuir Road in the Corstorphine area on the west side of Edinburgh is a little parking area. Park up here and head straight on onto the path up the hill. Continue heading along this path, keeping the iron fence to your right. You might hear some roaring going on here as the fence is the outer perimeter of Edinburgh Zoo. Keep going and about 1/2 a mile over the hill you’ll be able to see directly into the Zebra enclosure at the zoo. Right here is bench with a fantastic view over the city. Take a BIG lens, at least 200mm, bigger if you have it. 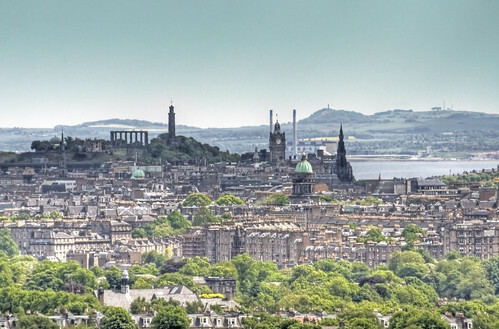 The Castle looks great from here with Arthur’s Seat directly behind but my favourite is taking the shot of Calton Hill and you’ll get East Lothian right the way to North Berwick as a backdrop. 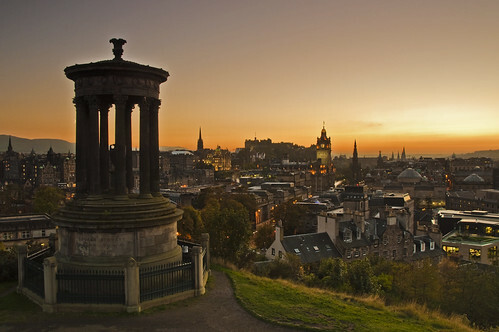 No visit to Edinburgh could be complete without at least one visit to the Royal Mile. You could spend days here and not photograph everything. However, if you only do one shot, it has to be St Giles. 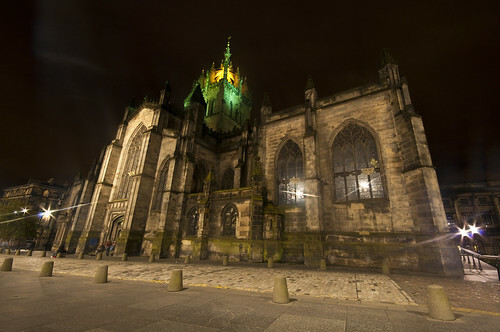 Hard to miss near the top of the Royal Mile it’s a photogenic building at any time of day but my favourite again, is nighttime when it’s all lit up. Ok, so admittedly this one is pretty seasonal. 3 weeks in August to be exact. 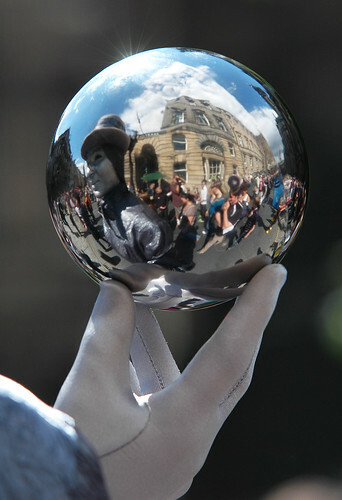 If you’re in Edinburgh in August then you’re in for a rare photographic treat. 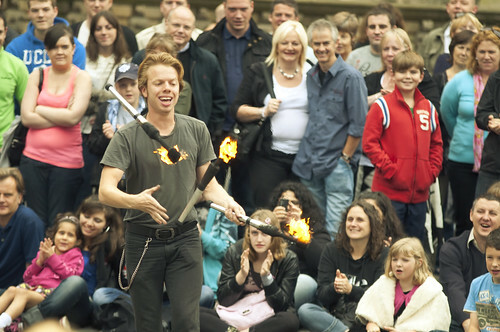 With huge crowds and street acts performing from 10 to 10 nearly every day you could spend hours here. My personal recommendation is a decent zoom lens; a 70-200 is perfect as you wont always get that close to the acts. Expect to take hundreds of pics in an afternoon here! It might not be the Angel of the North but Edinburgh does have six of it’s own Anthony Gormley statues. With number 1 found in the pavement outside the Gallery of Modern Art the other 5 are dotted down the Water of Leith until you get to the final one, which is situated in Leith Docks Western Harbour. Head down to Ocean Terminal shopping centre, that’s the one with ex Royal Yacht Brittania on display and head past all the parking areas till you get to multi story car park at the Debenhams side. To the left of the car park is a little walk along the dockside. Keep going here and there’s a derelict old wooden pier at the end of it. 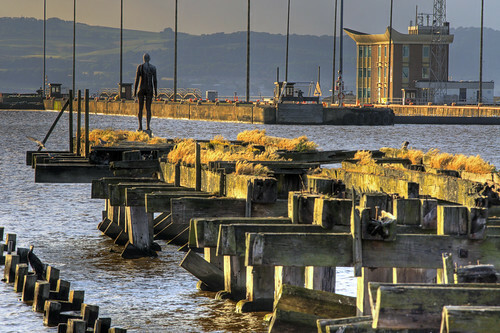 The Gormley stands right at the end of the pier. 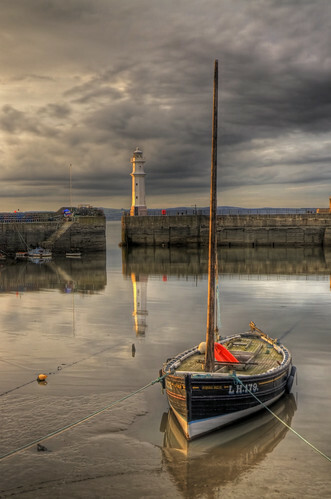 Just 5 minutes along the shore from the Gormley lies the small but picturesque Newhaven Harbour. The main focus here is its lighthouse at the harbour entrance. Sunset works well down here but any time of day will give you a decent shot from somewhere. 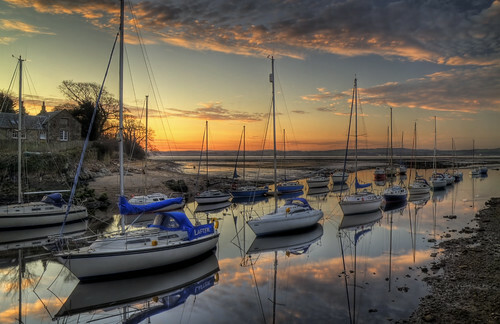 Cramond is one place probably overlooked by visitors from Edinburgh, tucked away on the coastline just past Silverknowes. 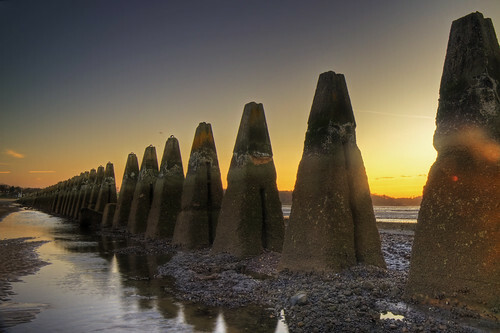 Cramond is mainly thought of for its island and sticking causeway, featured in part 1 of this blog. However, with the boating club mooring many boats along the mouth of the river Almond there’s a great chance of a nice nautical shot here. Look for the roundabout with the mast structure on the promenade near the causeway to the island, head upriver from here and there are some steps down to the water, a perfect spot looking down the river, especially earlier in the summer where sunset will light the shot perfectly. 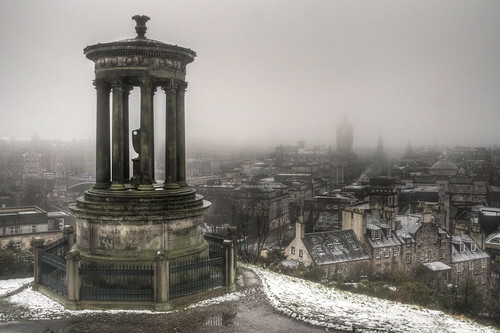 One of the many monuments on Calton Hill the Nelson Monument is famous for it’s time ball on top, which is raised and lowered on the fire of the One o’clock Gun on Edinburgh Castle. The monument itself is the highest structure on the hill and gives great views of the city from the top. 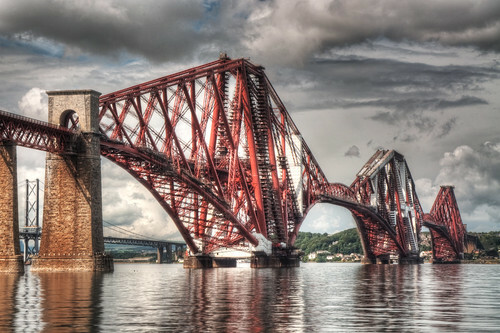 It’s a striking structure in its own right whether viewed from Princes Street of from right underneath. 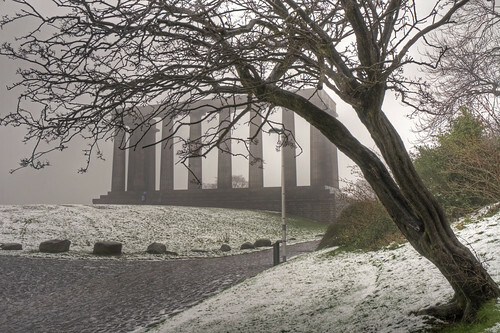 If you’re up on Calton Hill you’re only minutes from this shot. Head down the hill and head off to your left to Regents Road. 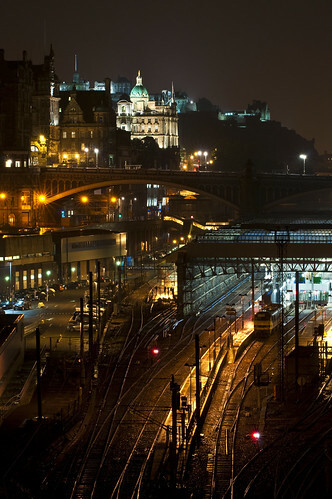 On the right hand pavement there is a small set of steps called Jacobs Ladder, from here you get a view over Waverley Station, the North Bridge all the way up to Edinburgh Castle. Great shot at night. 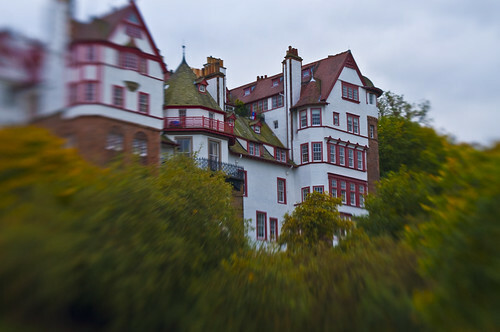 Probably never seen by visitors to Edinburgh is the Cammo Estate on the western edge of the city. 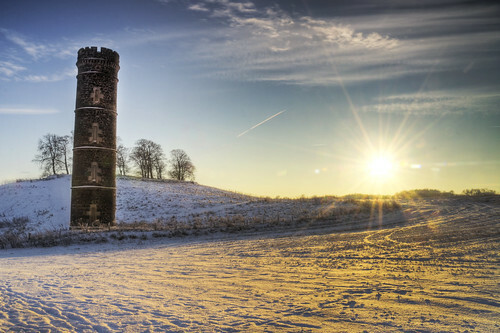 Tucked away between the Barton area and Edinburgh Airport is a large area of public meadows and woodland. 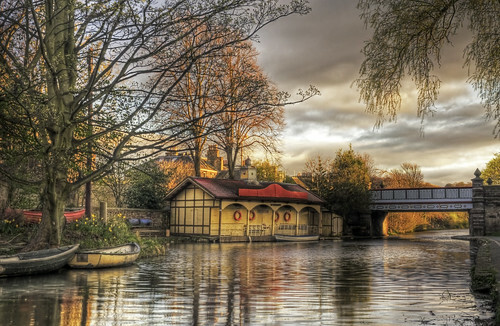 It’s a great place for a walk and the photographic potential is huge at any time of year. However one structure really stands out, the historic water tower on the eastern edge of the estate. Slightly creepy, it’s an interesting shot to take at any time of year. So there you go, another 11 must haves. Feel free to add your own shots in the comments!